The origin of the Pug as a breed probably begins in ancient China, although it certainly didn’t look the same as today’s dogs. Dogs known as “short mouthed” dogs are described in writings that date to about 600 B.C. and were probably the forerunners of the modern breed that we call the Pug. Emperor Kang Hsi, about A.D. 950, commissioned a dictionary of all the Chinese characters, and in it, there are two references which could describe the Pug: “dogs with short legs” and “a dog with a short head.” By the 1300s there were three main types of dogs that are identifiable as founders of breeds of today: the Pekingese, the Japanese Spaniel, and the Pug. It wasn’t until the latter portion of the 1500s and early 1600s that China began trading with European countries such as Portugal, Spain, Holland, and England. Small dogs presented as gifts returned from the Orient with the traders, and thus began the rise of the Pug in popularity in Europe. The Chinese had often interbred among the three types of dogs they favored, and so many times breeders would find a long-haired Pug among a litter of puppies, as well as white spots on the head. By the early 1900s, a book called Dogs in China and Japan had been written. This book drew heavily upon the experience of Wang Hou Chun, a servant who had bred and worked with the dogs in the Emperor’s Imperial Palace for seventy-five years. He used the term Lo-Sze to describe the Pug, noting that the differences between the Pug and Pekingese were that the Pug always had a short coat, and very supple, elastic skin. Many Oriental Pugs, though, had a great deal of white on their bodies, and some were almost entirely white. These white and pinto spotted Pugs are documented in Europe as late as the end of the 1800s, but the lines that produced them were eventually allowed to be lost. The Pugs that were traded to Europe seem to have first landed in Holland, possibly as a result of the famous trading company, the Dutch East India Company. The Dutch named the breed Mopshond, which is still in use today. Pugs were known to be within the household of William III and Mary II when they ascended to the throne of Great Britain in 1688. Black pugs are known to exist in the 1700s thanks to William Hogarth’s painting of one in House of Cards (1730). The artist was a proud owner of pugs (a trait that seems to continue through to today), and depicted many in his paintings so that there is an excellent visual record of the Pugs appearance dating back 250 years. The Pugs popularity spread throughout Europe, with the breed referred to in France as the Carlin, in Spain as the Dogullo, at the same time, they were Mops in Germany and the Caganlino in Italy. In France, the breed was popularized by Josephine Bonaparte, owner of the Pug named Fortune. Goya painted Pugs in Spain in 1785, showing the breed with cropped ears in his paintings. By the turn of the century into the 1800s, Pugs became more standardized as a breed, with colors separating and settling into the contemporary “fawn” or “Isabella” and black colors. It is also known the “black mask” was in place by now, too, as the breed had been referred to as the “Dutch Mastiff” from time to time, harking back the masked face of the much larger Mastiff breed. The late 1800s saw the beginning of dog shows in England, and Pugs were first exhibited in 1861. The studbook began in 1871, and there were sixty-six Pugs in the first volume. The English Pugs developed mostly along the lines of two strains: the Willoughby and the Morrison lines. Each had consistent breeding traits, and the lines existed for many years as competitors. Willoughby Pugs were developed by Lord Willoughby d’Eresby and had what is today considered a “smutty coat” because it had a mixing of fawn and black hairs in it. The color has been described as “stone fawn.” The heads of these dogs were almost entirely black and they had wide traces, and even saddle marks on their backs (dark patches of hair shaped like the saddle of a horse). Their bodies were thin and leggy. Mops and Nell were two prominent Willoughby Pugs that can be found as ancestors in Pug pedigrees even today. A major impact on the Pug breed in the 1800s occurred when, in 1860, two Pugs of “pure” Chinese lines were brought to England. These two dogs, Lamb and Moss, produced a son named Click, and Click..well, he clicked! Click was bred many times, and his blood helped to mix the Willoughby and Morrison lines making Pugs a better breed overall and shaping the modern Pug of today as we know it. Looks are what a Pug is all about. This man-made breed was created just to look like they do. Pugs are not French Bulldogs with fallen ears, and they’re not miniature Mastiffs or Bullmastiffs. They’re really not related to the Shar-Pei. About the closest thing to a Pug (besides another Pug) is a Pekingnese, and that’s to be expected with their similar histories. Pugs in the United States are classified as a Toy Breed, even though they are usually the largest of all the Toys. Pugs should weigh from 14 to 18 pounds, which makes them very sturdy dogs in the Toy Group. While they are described by weight, the dogs have to be in proportion to their height and bone. The body of the Pug is similar to that of a Bulldog, but not as large or as overdone. Their overall appearance should be square: the height from floor to top of withers should be equal to the length from the sternum (breastbone) to rump. The Pug’s head is the most unique and readily identifiable feature. The head itself should be round when you look at it from the front. From the side, the face should be flat without too much or too little chin. Pug eyes are round, dark, expressive and full of life. Their ears are set widely on the head, and there are two accepted types of ears: rose and button. Button ears fold over with the fold of the ear level with the top of the skull, and should not hang lower than the corner of the eye. Rose ears appear to be smaller and fold with the inner edge of the ear against the side of the head. The rose ear tends to give the head a smaller, more rounded appearance. Ears must be black all over. Wrinkles on the Pug head should be deep and easy to see because inside the wrinkle the color is darker than outside. One large over the nose wrinkle is preferred. The other major identifiable feature of the Pug is his tail. The tail is set up high on the back and should be curled tightly. The double curl (two complete loops) is the ideal tail that breeders try for, but a single tight loop or twist is acceptable. It is uncharacteristic of the breed to have a floppy loose tail that bounces over the Pugs back or a Pug who carries his tail uncurled. Pugs basically come in two colors: fawn and black. Either is acceptable, although the blacks seem to be harder to come by. Many times over the years the fawns have been called, “apricot fawn,” “silver fawn,” “stone fawn,” etc. in an attempt to differentiate them, but they are all still just fawn Pugs. Apricot fawns will have a peach or apricot tint to the coat that can have an almost clear, cream-colored base coat. The other fawn coat has a mixing of black-tipped guard hairs in it, making the dog appear darker and “cooler” in color. All of these colors are acceptable – it is only the very dark coloration over the entire body of the dog that is considered “smutty” and undesirable. Either color can have a few white hairs on the chest, and both colors will turn grey in the muzzle as they age. People seem to think that getting dog these days is just a matter of choosing one that looks cute to them. With so many different breeds of dogs being portrayed unrealistically in movies (Milo and Otis© comes to mind, as does Homeward Bound© and Pocahontas©, etc.) it’s easy for people to think that dog ownership today is simple, a snap, a breeze, and that they’ll have loving intelligent companions for the rest of their lives. Pugs are cute – if you love them, you think they are the cutest breed around. People who consider them ugly just don’t see the beauty in the breed. Are you looking for a dog that will make you laugh? Then a Pug may be good for you – they are natural clowns and show-offs. Are you looking for a dog that is good with children? Then a Pug may be good for you as they seem to consider children to be “pug-sized” people. Are you looking for a dog as a companion to your kids, to run after them on their bikes up the street? You should pass on Pugs – their sensitivity to heat and small size makes that almost a certain death situation. Do you want a small watchdog for an apartment situation? MAYBE a Pug can work – but it’s not usual. Most Pugs won’t know a stranger in their entire lives, let alone recognize a burglar. Do you want an easy to train dog? 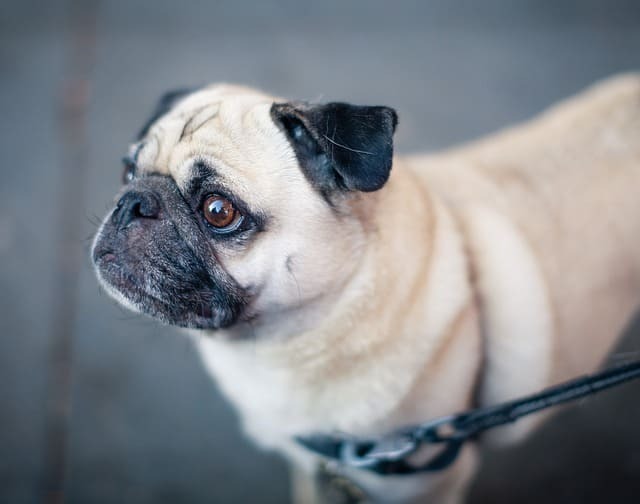 Pugs don’t fall into that category in general – usually, they want to please you, but sometimes it takes a Pug longer than other breeds to understand what you want. Do you want a short haired dog because it will shed less? Then run, don’t walk, away from the Pug breed. This breed sheds copious amounts, usually seasonally. Do you want a dog that’s almost human-like in personality? Then consider a Pug, as Pugs have more personality than they know what to do with! Buying a healthy dog is important these days – so many people talk about “back yard breeders” and those people who “inbreed” their dogs. You’ll find that being an informed purchaser will help you find caring, conscientious breeders. Breeders who “inbreed” are not necessarily bad breeders – but they should be able to tell you what their reasons are for the inbreeding that they do. Reputable breeders will have some sort of health agreement with you – they’ll want you to take your new puppy or dog to your own vet shortly after you get it home, so that you know it’s doing okay. They should be knowledgable or at least familiar with the problems outlined here. Don’t be afraid to ask questions of a breeder – good ones will share knowledge with you so that you understand what the advantages of buying from them is, but also the risks. NO BREEDER can ever produce 100% healthy-for-life dogs. Just as in humans we cannot “breed out” certain problems in our own genetic makeup, dog breeders can only do their best to work towards limiting problems in a line of dogs. Line breeding and inbreeding are two of the tools that, when used properly, can help in identifying and reducing the health problems in a breed. Pugs also have a high incidence of demodectic skin mites (often called demodectic mange), especially when they are still puppies. Mange does require a veterinary to treat it. Some lines of Pugs do not whelp their own puppies well, and often require C-section surgery at birth. QUESTION: What’s the difference between a Pug and a Chinese Pug? ANSWER: Absolutely nothing. Pugs are known as Pug Dogs, Pugs, and Chinese Pugs interchangeably. The American and English Kennel Clubs register the breed as the Pug, as does the International registry, the FCI. ANSWER: In a word, yes. Almost every Pug snores, and usually, it’s not as loud as a person, but it can easily be mistaken for someone snoring. Pugs snort, snarfle and snore and often will pass a lot of gas too. Just expect them to be noisy dogs, but not barkers. QUESTION: Pugs have short hair so they don’t shed very much, do they? ANSWER: Pugs shed tons of hair! Pugs have both a top coat and an undercoat, with the top coat having long straight hairs and the undercoat having softer fluffy straight hairs. Normal hair length on a Pug is about 3/4 of an inch, although they can be longer. Don’t let anyone tell you that Pugs do not shed – they are more interested in getting you to take one than telling you the truth. QUESTION: I don’t want a dog in the house. Why can’t Pugs stay out of doors? ANSWER: Pugs cannot tolerate high heat and humidity for very long. Dogs cool off by panting and their long tongues and noses give them more cooling area. Pugs have virtually no cooling area for their bodies, so they can (and will) literally overheat and die in less than 30 minutes outdoors in high heat and/or humidity. ANSWER: Because a long time ago someone decided that Pug faces should be as flat as possible. The wrinkles are there because the Chinese emperors wanted lucky symbols on the dogs foreheads, and wrinkles were the best way to get them. QUESTION: With all those wrinkles, what special care do Pug faces need? ANSWER: Care of wrinkles in Pugs varies, as some dogs are prone to holding moisture in the wrinkles, while others do not. In general, wrinkle care is as simple as using a tissue (don’t use a cotton swab as you can poke too hard with it) and wiping out the wrinkles on a weekly basis. Pugs, while having no-noses, are some of the nosiest dogs out there, and tend to gather a lot of grungy stuff (that’s the technical term for it) in their wrinkles. If the wrinkles also trap moisture in them, then the moisture and grungy stuff combine and the wrinkles can quickly be infected. This is like having athlete’s foot but on the Pug’s face. It needs to be treated and watched for. ANSWER: Really not that much. On a weekly basis, you should brush their coat, keep their faces clean and check their eyes for problems. Must Pugs take about 20 minutes a week per dog. Monthly, you should also trim their toenails, and maybe give them a bath if they need it. Many owners find using a shedding comb monthly greatly reduces the amount of Pug hair on their clothes and carpets. QUESTION: Which is better for just a pet – a male or a female Pug? ANSWER: In general, males are more laid back, loving and people oriented than females tend to be. Females, on the other hand, make better alert dogs (they watch for strange things going on at “their” house) and are more aloof and independent. If you’re looking for a couch-potato type dog, then a male would be better suited. If you’re wanting a dog who’s pretty independent and not as demanding, then a female is probably better. These are generalities, of course. There are some males who are independent and some females who are more people oriented – but for the most part the characterizations hold true. QUESTION: How long do Pugs normally live? ANSWER: Being a small breed, healthy Pugs normally live from 12 to 14 years, but can live for many more. Becoming a Pug owner becomes a long-term commitment when you realize that you can have a Pug for as long as your children are going to school! QUESTION: Do Pugs make good watchdogs or guard dogs? ANSWER: Not usually. 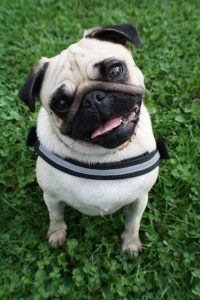 Some pugs may alert you that someone is nearby by barking gently (Pugs don’t bark loudly, in general, because it’s muffled by the lips), but most Pugs are more interested in greeting new people rather than scaring them off. The look of the Pug often will scare people – especially if you have a Bullmastiff in the yard too. Then you can just say that the Pug is a puppy and it grows up into the Bullmastiff (sorry, that’s Pug humor). QUESTION: Do Pugs really like to dress up in costumes like I see in all the pictures? ANSWER: Actually, they usually do. Pugs are very extroverted dogs and do just about anything for a laugh from their people. If they discover that wearing a costume makes you happy, they’ll do it. If it gets them laughter and applause, that’s even better! QUESTION: Pugs are so cute, everyone wants one, and mine cost so much, I can really make some money if I breed my girl Pug, can’t I? ANSWER: That’s very doubtful. The costs of raising Pugs are pretty high. 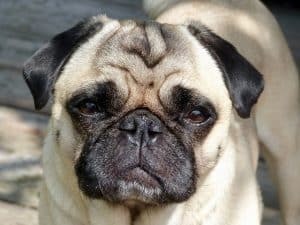 Start with the breeding: Pugs should be at least two years old, and need to be tested for eye problems, hip problems, and brucellosis before they’re bred. Your girl should be up to date on all her shots before you go into this, as well as wormed. Then pay the stud fee, which is usually the price of a puppy or more. If you ship your girl, add a few hundred more there too to get her to him and back. Then there’s the waiting time, and hoping she’s bred. If she is, consider that she may require a C-section. Many female Pugs have narrow hips, and with their big heads, Pug puppies can’t fit into the birth canal. If you’re lucky, you’ll have an average litter of four or five puppies. But if they were born by C-section, the dam may not be able or willing to nurse the pups. So, you’ll need bottles and formula, a way to keep the pups warm, and round the clock feedings for the first few days at least. Will you have to take a week off from work to raise the puppies at first? Add that cost into the figures. Then being a responsible breeder, you will offer a health guarantee on your puppies, and take them back if anything is wrong with them, yes? There’s much more than putting two dogs together. And rarely do breeders show a profit in doing so when they count up time and actual expenses. ANSWER: Yes, probably many times. Some people just don’t appreciate the good looks of a nice pug. Some people don’t appreciate Picasso’s works, either.